[SatNews] DigitalGlobe, Inc. (NYSE: DGI) has reported that, as a result of its annual satellite life review, the company will extend the useful lives of two of its satellites: WorldView-1 and WorldView-2. The company has also assigned an initial useful life to its newest satellite, WorldView-3, that is slightly longer than the original use lives assigned to WorldView-1 and WorldView-2. The extended use lives will drive improved capital efficiency, lower capital expenditures, and better cash flows for DigitalGlobe. WorldView-1 will be extended by 2.5 years to 13 years, a 24 percent lifespan improvement, and WorldView-2 will be extended two years to 13 years, an 18 percent lifespan improvement. In addition, the use-life extensions will result in non-cash reductions to revenue and depreciation expense effective October 1, 2014. WorldView-1, which was originally expected to reach its end of life in the second quarter of 2018, is now expected to reach end of life in the fourth quarter of 2020. As previously disclosed, the period of recognition of deferred revenue related to the NextView contract will be extended to reflect the new longer use life of WorldView-1. Beginning in the fourth quarter of 2014, this change will reduce the non-cash amortization of NextView deferred revenue by $10.4 million annually and $2.6 million per quarter—from $25.5 million to $15.1 million per year, and from $6.4 million to $3.8 million per quarter. Depreciation expense on WorldView-1 will decrease by $18.4 million per year and $4.6 million per quarter. WorldView-2, which was originally expected to reach its end of life in the fourth quarter of 2020, is now expected to reach end of life in the fourth quarter of 2022. This change reduces non-cash amortization of deferred revenue related to certain Direct Access contracts by $1.4 million annually and $0.3 million per quarter. Depreciation expense on WorldView-2 will decrease by $10.2 million per year and $2.6 million per quarter. 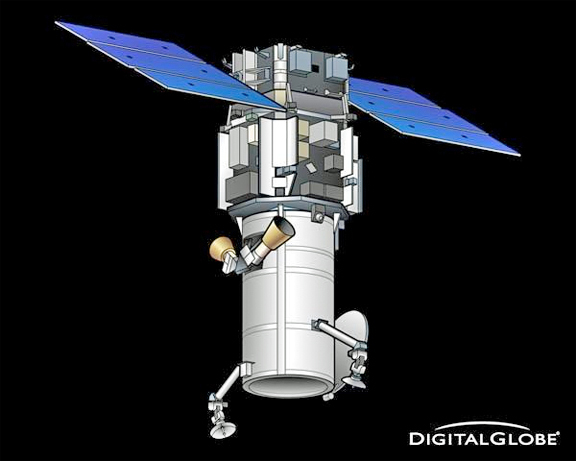 WorldView-3, which was launched in August 2014, has been assigned an initial use life of 11.5 years through the first quarter of 2026, leading to depreciation expense of $56.5 million annually beginning on Oct. 1, 2014. The company continues to expect to report revenue for the full year 2014 in a range of $640 million to $660 million. EBITDA, Adjusted EBITDA and capital expenditure estimates also remain unchanged from expectations provided on the company’s third quarter earnings announcement on October 30, 2014. The DigitalGlobe infosite at https://www.digitalglobe.com/ has additional information.